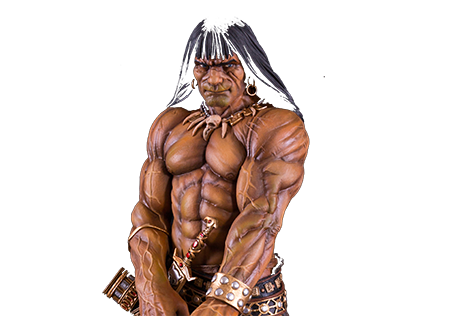 A quick review on this massive Conan diorama 1/4th scale statue sculpted by Arahom Radjah, filmed on location at New York Comic Con in 2013. This Conan diorama was without a doubt the main attraction of the whole show. It was impressive to see how many people stopped at the booth to take pictures and film this piece. The statue was released for pre-orders a few weeks after the show, and was a great success in sales for ARH Studios. Featuring 5 interchangeable heads and 3 different weapons of choice to display, this piece gives the collector many different ways to display it. The diorama was sold separately as a second independent product, and the whole piece came in three huge boxes. Without a doubt the most audacious statue released by ARH Studios so far .